One of David Tossell’s previous books, Grovel! , was a superb account of the West Indian tour of England in 1976 and the title was gleaned from Tony Greig’s infamous pre-series claim which readers will surely be aware of. I was very much looking forward to reading the same author’s book about the England captain in that series and it certainly does not disappoint. 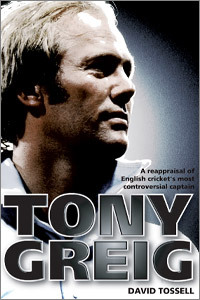 I am often surprised that not more books have been written about Tony Greig who was certainly one of the main players in his comparatively short international career in the 1970s. In this very well-researched book, David Tossell writes in a chronological order about the life of Tony Greig. After the interesting introduction, there are three sections - All Rounder, England Captain and Rebel Rebel. At the end of the book there is a brief statistical section which possibly does not do Greig complete justice as a player but there are so many facets to the man which statistics cannot show. We know besides that he was a thoroughly decent player who loved the big stage. He became a hero in India with his many skills as a man and player and that despite beating India in India and having to contend with the Vaseline affair. Tony Greig will be remembered for many reasons. A tall, fair South African who captained England and played in 58 successive Tests - his entire career - and his outspoken comments both as a player and subsequently as a commentator in which he could always be relied upon to enliven the most predictable of finishes. It will, however, be his role in helping Kerry Packer with World Series Cricket which he will chiefly be remembered for. His has not always been the easiest of passages and opinion will always be divided about him. Tossell’s research is admirable as are his descriptive powers. Lest we forget Greig’s bowling action, we are quickly reminded of it no later than the third page of the introduction. “ When we saw him bowl it turned out that, for all his blond-haired athleticism, he had a laboured, pigeon-toed approach to the crease, arms pumping like pistons. When, later in his career, he switched from medium pace to off-spinners he gave the impression of a contestant in a slow bicycle race, intent on taking as long to reach his destination as his ground-eating legs allow. It was impossible to properly copy his arthritic-looking action without losing balance.” It is reassuring to subsequently find that his results were commendably better than his aesthetic qualities. David Tossell covers all the well-known incidents concerning Greig in good detail and has interviewed Greig’s Sussex and England team mates so that a fair picture is given of his subject. Greig’s record, his exciting and dashing play and the healthy respect afforded to him by team mates should suggest that he deserves a better place in cricket history. Naturally, with the Packer era greatly offending the Establishment, he may not be remembered as he might have been but maybe David Tossell’s re-appraisal of this colourful and exciting character may lead people to re-assess Tony Greig’s vast contribution to cricket .